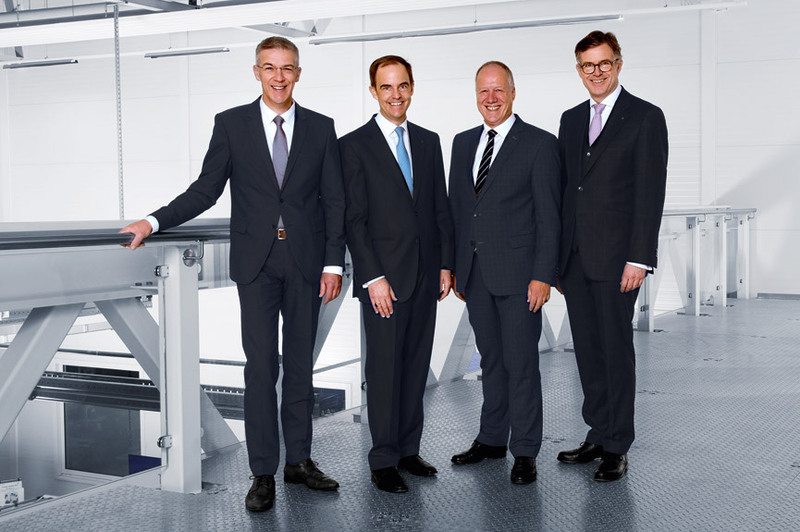 The Böllhoff Group enjoyed a healthy development in its 141st financial year. The company celebrated its 140th birthday on January 6, 2017. Böllhoff now operates on all five continents in 24 countries and at 40 locations with 3,000 employees. With a new sales record, the financial year 2017 was a highlight in the company’s history. Once again, the family-owned company with headquarters in Bielefeld has grown strongly. Sales rose by 8 percent to 620 million euros. “We have used the healthy economy to expand our activities in the relevant markets in Europe, Asia and North and South America,” says Michael W. Böllhoff. “Through innovations for new applications and investments in more capacities and more efficient processes, we were able to achieve disproportionate growth,” adds Wilhelm A. Böllhoff. In the Archimedesstraße in Bielefeld, there are now 1,100 people employed and 1,375 in the whole of Germany. Böllhoff consistently relies on training its own junior staff. 60 young people are trained each year for commercial, technical and logistical tasks in 17 different professions and five dual study programmes. This ensures that the company’s growth can be mostly achieved with its own junior employees. 2018 has started well for the Böllhoff Group. The order intake is at a high level. Further growth impulses are expected from the cooperation with automotive and industrial customers. Sales are therefore expected to rise again this year. The Böllhoff Group is reacting to the positive development of recent years with further investments in logistics and production. The combined investment volume for 2018 and 2019 will amount to 150 million euros. Böllhoff will shortly start to build another logistics centre in Oelsnitz-Taltitz in Saxony. The central location allows an optimal logistic connection to all European sales markets. Around 100 jobs are to be created in the coming years during the first stage of expansion. With more than 10 hectares, the location also offers sufficient reserves for further growth. In Bielefeld, the former factory buildings in Duisburger Straße are currently being modernized and brought up to the latest technical standards. In the course of the year, the metal production facilities will move there from Archimedesstraße. The area then made available will be used to expand production capacities for plastic injection moulded parts. This will also create new jobs in Bielefeld. Böllhoff is also investing in foreign growth markets. The largest investments will be in France and China, also to expand logistic and production capacities. In 1877 Wilhelm Böllhoff founded the company in Herdecke an der Ruhr as a national ironware wholesaler for metalworkers, blacksmiths and industrial users. As a reaction to the French occupation of the Ruhr region, his son Josef Böllhoff established a branch in Bielefeld in 1923 specializing in screws, nuts and threaded parts with a focus on mechanical engineering and ship building. In 2018 the range of products is significantly larger. The original assortment of standard parts has been developed further. Threaded inserts, quick-release fasteners, self-piercing rivets, adhesive fasteners and precision plastic parts have been added. The core business today is not only to support the customers with a wide range of products, but to accompany them throughout the complete value-added chain; optimizing processes and reducing costs. This strengthens the customer’s competitive position. The portfolio of technologies and services aims at combining modern materials and construction methods, economical procurement, stocking and delivery as well as the reduction of assembly times and costs. Böllhoff’s corporate philosophy: From the screw to the completed assembly. Today, all manufacturers in the automotive and aerospace industries as well as many companies in mechanical and plant engineering, the sheet metal and plastics processing industry and the electrical industry belong to the national and international customer base.